As 6sqft previously reported, the three buildings that comprise the Upper West Side‘s Waterline Square are rapidly rising from a five-acre site overlooking the Hudson River. For the neighborhood’s most exciting and ambitious project in decades, a group of the architecture and design world’s most celebrated names was chosen by GID Development Group to create the master plan, with Richard Meier and Partners, Kohn Pedersen Fox Associates and Rafael Viñoly Architects each designing a residential tower. We’ve been graced with leaked renderings of what’s to come on several occasions; now, the project’s dream team has lifted the curtain on a comprehensive website that reveals so-far unseen renderings of the towers and their interiors, the 100,000 square feet of amenity space that will be shared between them and the three-acre park designed by Mathews Nielsen Landscape Architects. Your holiday shopping companion has arrived! For the second year in a row, 6sqft has asked a handful of New York City designers, architects and artists to share five things they plan of gifting this season (and maybe one they hope to receive). Ahead find 85 truly unique and unexpected items curated by the city’s most talented creatives. We promise that there is something for every budget and taste—and plenty of ideas to choose from if you happen to find yourself scrambling for a present at the last minute. West 44th Street between Fifth and Sixth Avenues is home to some of the city’s most elite hotels, such as the Royalton, Sofitel and Algonquin, and also to esteemed institutions like the Harvard Club, Penn Club and New York Yacht Club. 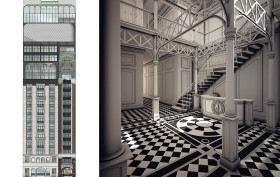 Near the stretch’s Fifth Avenue corner, a new 20-story, 96-key hotel tower is in the works at 7 West 44th Street, and it will be festooned in Baroque stylings, Juliet balconies, twisted columns, cast-iron railings, and a grand lobby staircase.